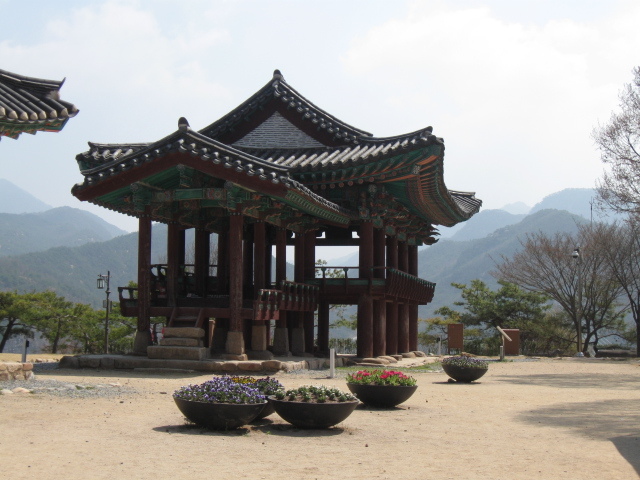 get on the fun bus – Hello Korea ! More and more my friend Miwha is turning into that thing I had hoped I’d find in Korea – someone who would take me in and share and give me a true welcome here. Last week she asked me if I wanted to go to Danyang with her. “That sounds great!” I told her, Where/what is Danyang? (insert research for you here later) Anyway, had to get up around 4:30 in the morning in order to take the first train from Cheongpyeong in order to meet her to catch the bus in time. Only her bus to the bus was late, and I missed the subway stop and had to back-track and was late. 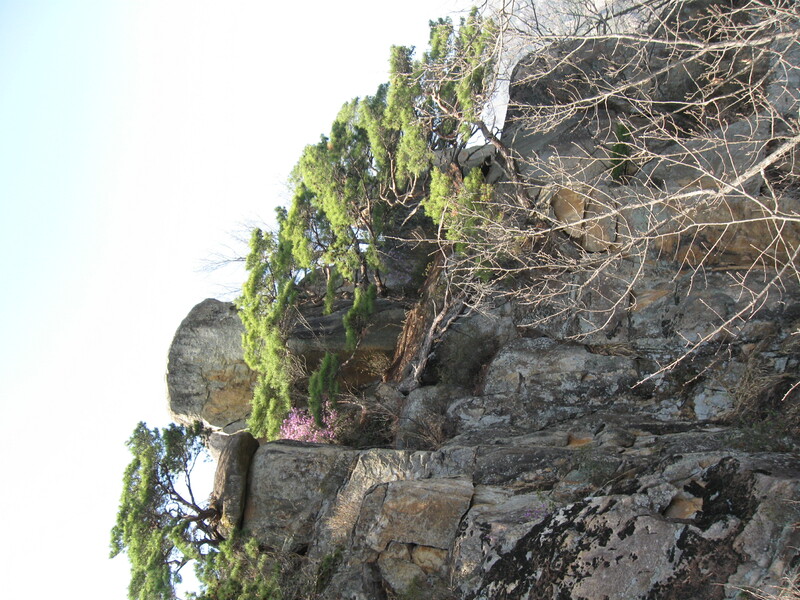 At our meeting place was no Miwha and her daughter, Suwon. But I saw a bus waiting there at a taxi stand. Only it wasn’t a bus station or a bus stop, but a Guided Tour Bus just waiting…And this man sees me and (I think) he says Miwha’s name. So I climb over the fence, and hop onto the bus, only there’s still no Miwha and Suwon! He has me sit in an empty seat, and I’m thinking OMG. What if he didn’t say Miwha’s and I heard wrong and I’m on a guided tour bus with all these ajummas and ajosshis to God knows where??? And then the bus takes off…After a few blocks, the bus stops and on climb Miwha and Suwon. This is one of those great things about a place where the entire country communicates by cell phone all the time: you can hold up tour buses and have them wait for foreigners and have them pick you up when you’re running late. Right now is cherry blossom time in Korea and there are lots of people going on excursions specifically to view some. So I was really lucky that for a couple miles as you get off the expressway and onto the highway to Danyang, the mountain switchback roads were entirely lined with cherry trees. It was really a pretty ride and I wish I had a motorcycle about then. Being a tour, I didn’t have time to take nice shots, so a lot of them don’t make the cut. But I’ve already shown similar photos in the past. Here’s another one of these pavilions. So lovely. Here is Suwon and Miwha sitting on the porch of a traditional laborer’s home that had been preserved and moved when the nearby dam got built. After that we ate at a mushroom restaurant and were told we would go on a ship. 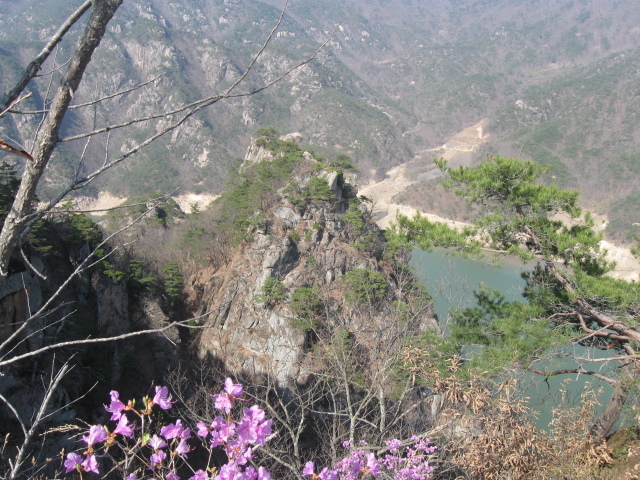 The ship was a little tour boat that went around the dam’s lake – so the lake has the same kind of feel to it as Chuncheon, where there is no natural beach but the mountains just rise out of the water. 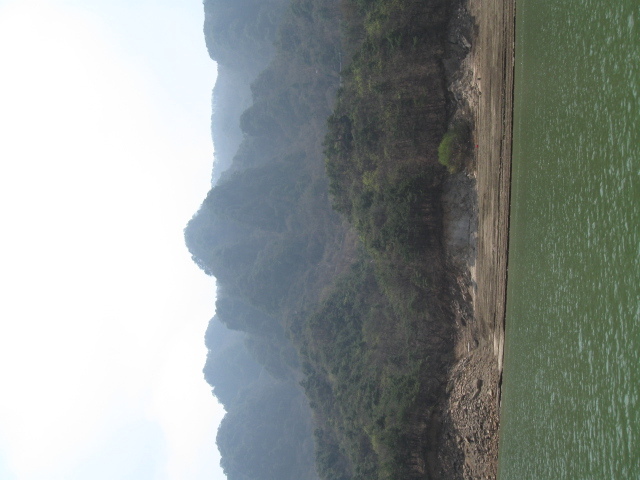 But here the mountains are actually more mountainous, due to the steep limestone. One of many gorgeous views from the boat. On every boat is an MC and a karaoke machine. And, unfortunately, they like to use microphones in Korea and everybody is a star. Suwon was really annoyed because everyone was old and because they go on these tours but do the same thing they do everywhere and don’t enjoy the nature around them. Which I agree with, but it didn’t annoy me because they were so cute…Here’s a little video footage of them having fun. As you can see, Koreans ARE NOT timid. AT ALL. Insecure around new things, yes, but not timid. Afterward, we were dropped off and were told we could choose from one of two hikes but that we had to be back in 4 hours. Surprise! This is a hiking tour! The only way to get Suki to go on a hike, I guess, is to not tell her she’s going on a hike. 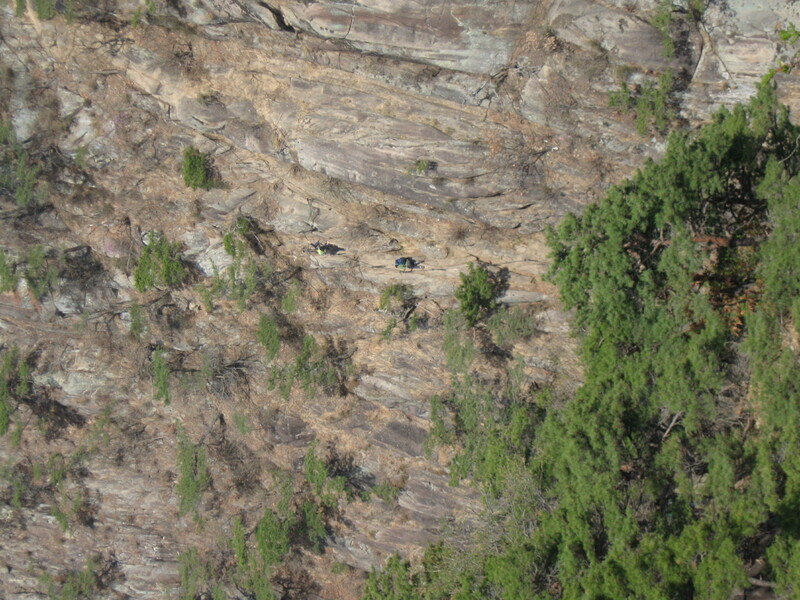 So here I am on my second hike in Korea. It was also extremely treacherous – no WONDER Miwha called and asked me for all my passport info, etc., so she could buy traveler’s insurance! But seriously – these hikes are really dangerous. You know, you look at terrain like this and wonder how anyone could have ever survived in it. 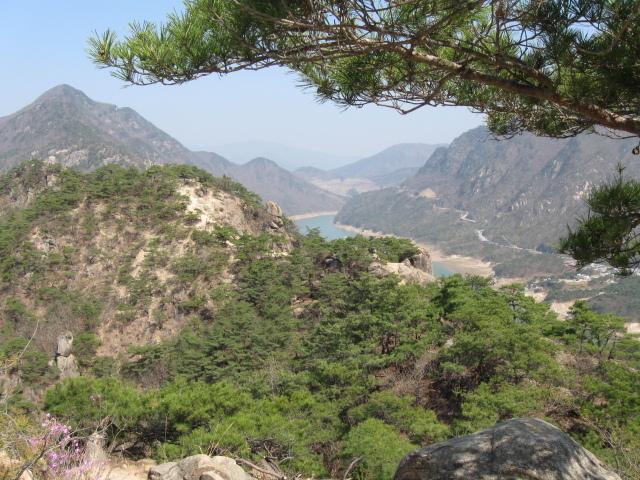 But then you hike with Miwha and her daughter, and (much more than other Koreans, actually) every couple of steps they’re exclaiming over finding some particular plant and telling me all the things you can do with that plant. I wish I could take notes fast enough or be able to transcribe the language correctly and photo and catalog all they say. Pretty much everything we passed you could eat in some way…They would joke as we walked over some foliage. “lunchee! lunch! more lunch!” Wild strawberries, wild carrots, a root similar to ginseng, pine nuts, needles make good tea, bark, this flower is edible, the nectar from this flower is good for this ailment, etc. I keep telling them to write a book but they dismiss it and say that all Koreans know this stuff. But I don’t think that’s true and certainly not all Koreans have the vast array of jars of different dried herbs and concoctions that Miwha regularly mixes together and has in her refrigerator and it certainly won’t be true twenty years from now. On this particular trail were two portions that were practically vertical rock faces. It was really fun and easy, though I had to psyche myself up for it. And the old folks were right there all the way. Such stunning beauty. Unfortunately, it’s spoiled by the amplified sounds of the tour boat MC’s and the party music. Miwha and Suwon were grousing that they were sick of hearing the same old songs every day…Songs, they tell me, from the time of the Japanese occupation. These songs the old folks hold onto, as if they are anthems, because I think for them they are songs of unity and hope. Hanging out with the old people was really good for me. You know, not long ago I used to look at old Koreans and have such mixed emotions. I’d be ANGRY because they’re the ones who threw me away while wistful that they held the key to Korea’s past and maybe my past. But these days I just accept that they had to make some tough choices and their government and those who directly profited from American deals who are really to blame. I think it’s really those who are now middle-aged, the ones my age, who sold their soul and the soul of Korea…for a slice of prosperity. And the youngest ones therefore have no compass as a result. And this profit by any means mindset has become institutionalized. And I now agree with all those who I talk to at any length who take me aside and advise me not to get my hopes up about Korea changing any time soon. Because Korea is part of the G20 now and the standard of living is really really high and Korea also enjoys some of the lowest taxes in the entire planet. (5% for the general public up to 10% for the wealthy) And the rich are not going to give that up easily. THIS is the main reason why the social services in Korea are so piss poor…and why babies are still sent away for adoption for lack of viable choices. Suwon has been doing a lot of reading about America, since she’ll be studying abroad next year. She tells me that Korea has copied everything bad about America but none of the good. And I kind of agree with her. And then she tells me she hates Korea. And I’m embarrassed, because the whole bus knows I’m an American and an ajumma is listening in and I’m hoping she doesn’t think it’s my influence. And so it goes with Korean youth, who recognize how spiritually bankrupt Korea has become and who feel repulsed by the legacy handed them yet unable to attain the promise of anything better. I tell Suwon it’s amazing she knows so much about plants and what they can do for health, and she says that it’s because she spent a summer with her grandmother, who taught her. I tell her she should write it all down. But she tells me it’s too late, because she’s forgotten most of it. I have faith Korea will get better. But it’s going to require a lot more Suwon’s going abroad and bringing back a new way for a new era. And it’s going to take a long long time. And I hope Korea doesn’t forget everything and that it manages to find a healthy identity for itself.